This is a super common and useful human movement. My hips are in flexion, but my spine is in neutral-ish, with a hint of extension. We were working on the hip hinge, which is a fabulous and important human movement, at the baseline of squatting, dead lifting, etc. I love it, I teach it, it's great, and we were looking at it in the context of picking up objects off the floor. Also great. The other people in the class noticed that the hip hinge felt balanced, used the glutes and back body, and felt stronger, which can all be true. The catch is that at some point, the conversation derailed to how moving at all with a flexed spine is bad, and that's where I disagreed strongly. To be clear, this was not only saying that picking things up off the floor with a flexed spine is bad, but that any flexed spine movements are bad. One of the students asked if a forward fold in yoga was injurious, and the teacher said yes, flexing the spine causes damage and low back pain. This was the first thing that made me angry. The teacher also said that it doesn't honor the curves of the spine. This was the second thing that made me angry. What was the group class takeaway from this? That the body should only be moving in neutral all the time to honor the curves of the spine. Is this possible? Not really. Unless you're superhuman, you sleep with a flexed spine, you walk with subtle rotations and side bends and constant movements in the spine and hips, and if you're reading this, you probably play an instrument, drive a car, and move in all sorts of ways both intentionally and accidentally. In this image, my spine is rounding over to pick up the object. In previous decades, the thought was that spinal flexion to pick up things led to back pain and disc damage. This opinion has since been debated and refuted. Is flexing the spine all the time a good idea? Probably not. Is it ok to move the spine in different ways if there isn't a pathology or reason not to? YES. Are all spine movements good for all people? NO. Is it a good idea to hip hinge sometimes? Absolutely. Should I flex my spine to deadlift my grandchild? 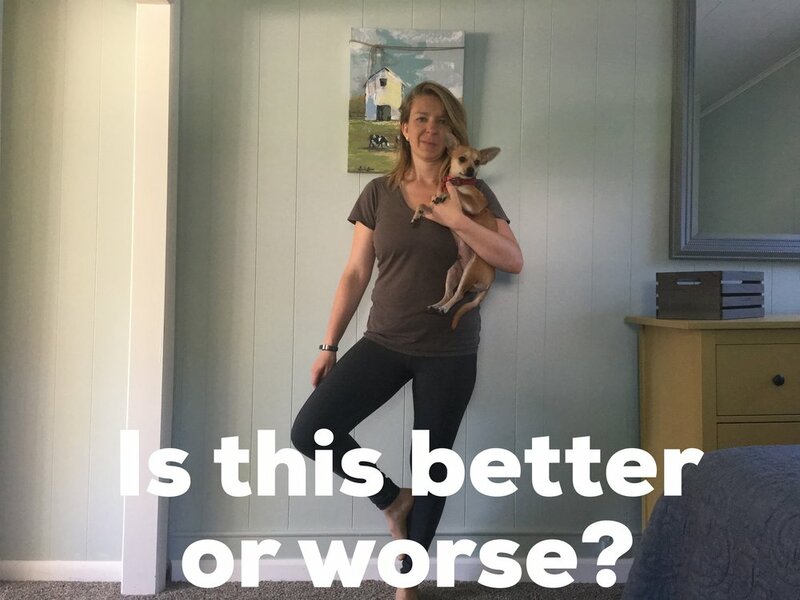 Probably not, although there is research that weighted spinal flexion is ok for some people and is not always correlated with disc damage and back pain. But I'm in favor of strengthening the back body and inviting glutes and hamstrings to the lifting party. The other piece of this is load and adaptation- how heavy is the object you're picking up? Is your body adapted to doing the movement? How often are you doing the movement? Do you always pick up objects the same way? 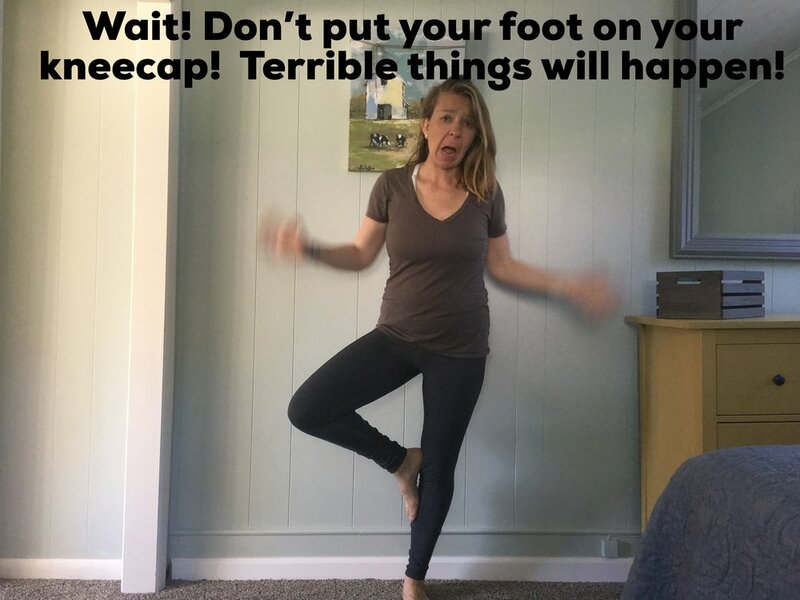 Needless to say, I almost jumped out of my skin in this class, because this may then make students afraid to move their spine in the myriad of ways that are possible at any given time. 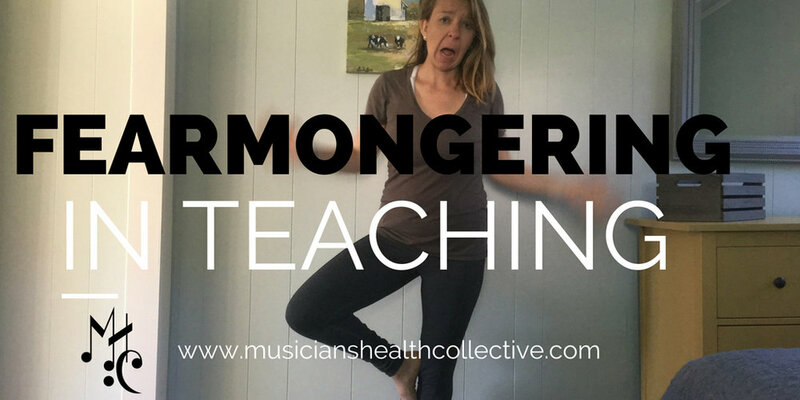 This is what I think of as fear mongering at it's finest, and it happens in music and movement instruction. This is especially better because my puppy, Milo, is looking photogenic. Fear mongering is well intentioned and comes from a place of wanting to help students, but it can lead to long term fears that are not helpful. On one hand, we have the dilemma of The Christmas Story Red Rifle gun, "You'll shoot your eye out," which not only doesn't deter Ralph but makes him think once he has one that he did shoot his eye out. On the other hand, there are students who fear every movement because someone has told them that x,y, and z are wrong with them and they can't do anything. Of course if someone has a pathology or injury, that's different, but if someone does not have an issue, how are we conveying information? 3) convinced I couldn't do anything because I "had weak wrists"
What's true in this situation? We need to gradually build strength and adaptation to load. Do you love yoga but not how it feels on your wrists? You need to build the range of motion and adaptation for that, rather than going once a week for constant wrist extension and then never doing those same movements during the day or week. As a person who now does lots of shoulder training and wrist extension work, it's about incremental progression. Just as we wouldn't expect to play a concerto at tempo in a week, we can't expect our bodies to do foreign movements suddenly without preparation. The big takeaway for me is that our words as teachers matter immensely, and that when we set up movements as good or bad, our students will take our viewpoints and authority very seriously, almost too seriously. Part 2 to follow! In the last three weeks, I've spent a lot of time in the car, driving from New York to Texas, and then all around Texas, thus my lengthy pause in writing. I've also spent the whole summer completing an anatomy and physiology course, and had the opportunity to see how disembodying anatomical science can be when divorced from the experience of feeling, seeing, and being in one's own body. Let me backtrack though- what does it even mean to be embodied? Most people, musicians and civilians alike, are disembodied, or at least, our modern society lends itself extremely well to being disconnected from one's body, one's thoughts, and one's physical and emotional experience of moving through the world. In the last few years, I've begun to see music-making and personal practice as a perfect vehicle for exploring these principles, especially under pressure. A friend played a mock audition for me over video, and I noticed how much attention and time she took between excerpts. She remarked, "I just need that time to get back into my body before I start-I can get so disconnected towards the end of a passage." I thought it was particularly poignant because performing under pressure requires this ebb and flow on attention, of coming back to the body and returning to the moment by moment experience of playing. All musicians will have heightened awareness around certain aspects of music-making: a wind player will be more attuned to breath and embouchure, a string player more aware of their hands and finger sensitivity, and so forth. What I mean is going beyond that to have a whole body experience- being aware of standing, breathing, and everything else while playing, regardless of your instrument. It's also using awareness to solve technical or musical problems- when my energy is frantic and unsettled, my bow changes and string crossings are less effective. When my left shoulder is relaxed, my shifting is more effective, and I can play well without overusing muscles in the jaw and neck. That's not to say that I can do all of those things all of the time, but it's maybe using one of those things as an anchor under stress- it's keeping contact with the body during Don Juan or Mendelssohn Scherzo, or Daphnis et Chloe. There are many inroads to bodily awareness- for me, walking is a helpful starting point, but many people love running, swimming, yoga, martial arts, and more. One can also be profoundly disembodied in all of those activities, but one might also use them as a lens for turning on awareness for the rest of the day. How can you explore your own movements both with and without the instrument to guide your problem solving and preparation skills? How can music making become a chance to explore your relationship to body, breath, and self-expression? I find myself constantly inspired by different movement practices- from Yoga Tune Up® to pilates to natural movement to body mapping to meditation practices, and I'm constantly learning and evolving in my body and awareness. There is no one somatic practice for everyone (although many teachers will tell you otherwise! ), and there are many paths to exploring your relationship with your body and music-making. Rather than seeing the body as a hindrance to musical perfection, why not change your relationship with it and begin seeing it as a vehicle to co-creating that which you wish to accomplish?